Here you can send real letters worldwide via the web. Four different gateways, seven supported formats for documents, 24hr support guarantee and fully automated processes ensure trouble-free orders at the first German web-to-letter-provider. Test us now! Every letter counts! The more letters you send within a month, the less expensive. See our price table for detailed information. We make it our business to make sending even single letters inexpensive and easy. PixelLetter is a gateway between your computer and the real mail system. 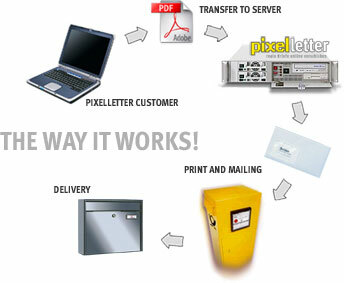 You send us your letter online, we print, fold, envelope, prepay and send it out within 24 hours. Whether invoices, business letters or info-mailings, we deliver everything you need: type in online; upload as a document; send us by e-mail or a short message service (SMS).